This book presents the key debates that the mathematics teacher will need to understand, reflect on and engage in as part of their professional development. Issues in Mathematics Teaching is suitable for those at initial training level right through to practising mathematics teachers. Its accessible structure enables the reader to pursue the issues raised as each chapter includes suggestions for further reading and questions for reflection or debate. Start reading Issues in Mathematics Teaching (Issues in Teaching Series) on your Kindle in under a minute. 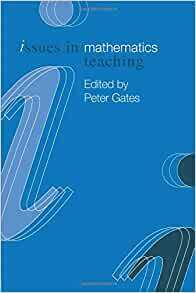 This text contains a range of issues relating to the teaching of mathematics. It is devised to build on knowledge already gained on ITT and PGCE courses and encourage students and newly qualified teachers to consider and reflect on the issues, so that they can make reasoned and informed judgements about their teaching skills. 4.0 out of 5 starsA very advisable book for PGCE in England!!! I think this book is very useful, and in fact is used in many English PGCE university courses about Mathematics in which many educational and social issues are tackled. For example, issues about social justice are treated in this book, that is, for instance the book tells how mathematics is used as a social barrier or filter that discriminates pupils depending on its social, ethnic or cultural origin, and what we can do in order to avoid these situations, as well as, the book defends an education in which heterogeneous groups are more frequent. The book also treats issues like teaching, learning difficulties and common misconceptions in mathematics, and finally assesment of mathematics. In my opinion is a book very advisable that talks about social justice, teaching of mathematics, learning difficulties, and equal opportunities or rights.